Stephen Cousins talks to Eckart Schwerdtfeger, BIM associate and programming guru at Zaha Hadid Architects, about custom scripting to push the boundaries of software, why more clients have started to demand BIM in 2018, and the future of design in the cloud. I spent over a decade as an architect focused on computational design, facades and programming. Around six years ago I became interested in BIM after I saw how it was gaining momentum and made the building process and collaboration more efficient. I came to the UK to advance my BIM experience and software skills and that led me to ZHA. Having computational design and programming knowledge is very useful because most software has scripting capabilities. It is possible to write custom scripts or external plug-ins that can enhance the software, overcome its limitations and optimise the underlying workflows. ZHA is known for its fluid freeform geometries and challenging structures, how has your use of BIM grown to support this? When I started at ZHA, around three and a half years ago, I was dropped into a major masterplan/new build project comprising around 50 buildings, many of which had freeform Zaha geometries that had to be brought into BIM for schematic and detailed design. However, Revit didn’t support custom freeform shapes efficiently enough. 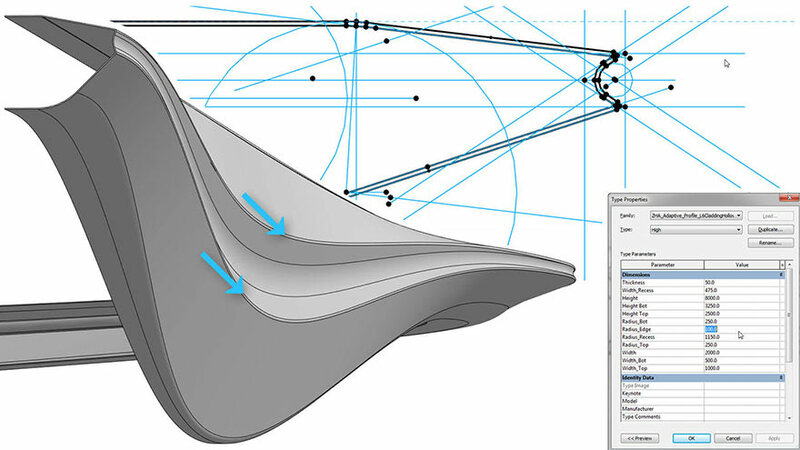 Importing them from our principle design tool Rhino involves about a dozen manual steps, which would have been enormously time consuming to carry out for the many thousands of freeform elements and frequent design changes. I looked at the application programming interface and realised that it was possible to program these steps automatically, so I developed a plug-in that would do the importing with a press of a button. This plug-in is referred to as ZHA BIM and is still heavily used by all BIM projects. It can also seamlessly transfer metadata between platforms, for example details on the material and parameters for characteristics like panel type, finish, colour etc. How have ZHA’s BIM scripting processes evolved? Programming software plug-ins and using them myself was highly effective on projects, but it created bottlenecks since not enough colleagues in the office were able to engage with it. Over the following years, the head of BIM, Harry Ibbs, and I started to introduce more accessible methods, such as visual scripting in Dynamo, which is now a requirement for all BIM staff. We also create parametric BIM elements that can facilitate design changes and future developments, for example increased Level of Development and change of dimensions within the software. What does your role as BIM associate entail? My main focus is to develop BIM tools and workflows that exploit my computational design and programming skills. I also manage the BIM team across a couple major projects, the most recent being the “Technopark” headquarters of Sberbank near Moscow, which just got planning permission. What is the office’s most advanced BIM project to date? The 45,000 sq m King Abdullah Financial District metro station in Riyadh, Saudi Arabia, which is one of around 100 stations on the expanded Metro network being delivered to BIM Level 2. The client had very detailed contractual requirements, including Revit and Navisworks BIM models compliant to Level of Development 350, that are used for coordination and will be handed over on completion in 2020. In addition, we recently doubled the size of the BIM team to deliver the masterplan and terminal 1 of the new Navi Mumbai International Airport in India, a huge, fast-track project with highly detailed BIM and 3D model requirements. ZHA has just one year to implement the project and get it through planning. 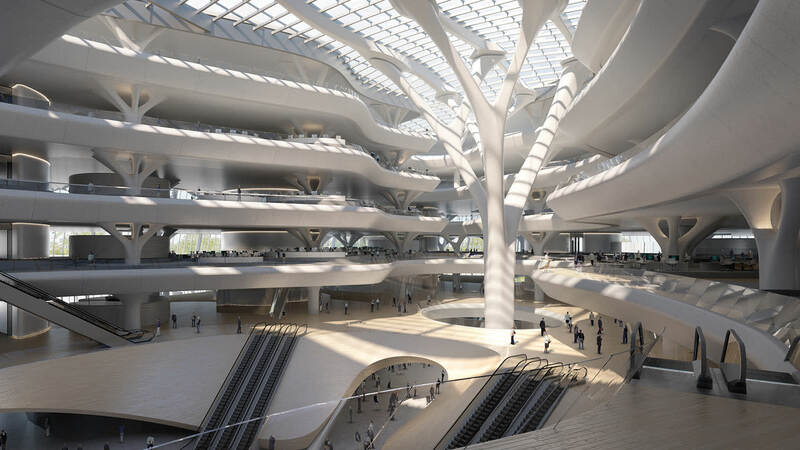 Does ZHA always encourage clients to work in BIM, or only on specific jobs? Up to and including 2017, BIM was only asked for or required on a couple of projects. ZHA has nevertheless tried to use BIM on large-scale projects because the office and its consultants prefer to work in BIM for efficiency, for drawing management and design coordination. There is always a drive within the business to encourage design teams to use the most advanced and future-proofed software. The situation noticeably changed in 2018. Most clients are now either requesting BIM or at least talking about it and asking if we can provide it. It is very interesting that even design competitions ask for a BIM model now, so the client can check the BIM capabilities of practices early on and make it a factor in their decision making. What about main contractors, are they working in BIM on your projects? Many projects we do are delivered by a general contractor and they tend to develop a BIM model using ours as a starting point or reference. That is much more accurate for our freeform projects than trying to create a 3D model using 2D drawings only, which can and has resulted in issues. 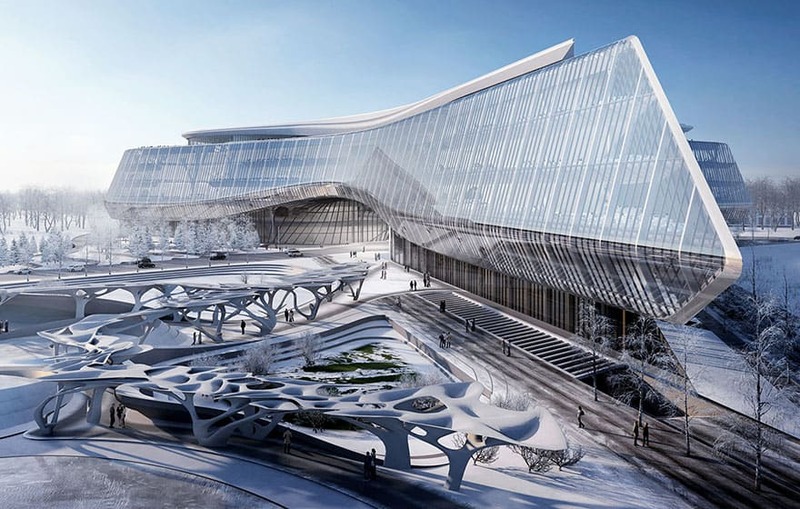 ZHA designs projects all over the world, which countries are the most advanced in BIM? The UK is very advanced and has detailed BIM specifications and guidance documents to follow, countries in the east, such as China, Russia and Malaysia are also frontrunners. Most projects we do in these countries now require BIM, mainly because the general contractor will be using it for delivery on site. Many actually refer to the British standards, or take them into consideration in their project specifications. What’s around the corner for design in BIM? Everyone is interested in the cloud and software developers are getting behind the idea, but it may be a few years before this is an effective alternative to working locally on computers using software we are all accustomed to. Cloud software still has privacy issues, in terms of understanding where your data is stored and for a person like me, a cloud solution could make it harder to customise the software and to enable efficient cross-application workflows. Currently, it is very useful for sharing, viewing, versioning and commenting on project data, but the idea of doing architectural design work and creating a full BIM model in a browser is not tangible, yet. Eckart Schwerdtfeger will be presenting talks on ZHA’s work with BIM, including many subjects mentioned here, at Autodesk University Germany and Las Vegas conferences later this year.